Joey Salgado, the Binay Camp spokesperson accuses Ombudsman Conchita Carpio Morales, an appointee of former President Benigno Aquino III, of taking a page from the Liberal Party’s playbook. This refers to her decision to press charges against the former vice president and his son, Junjun Binay. 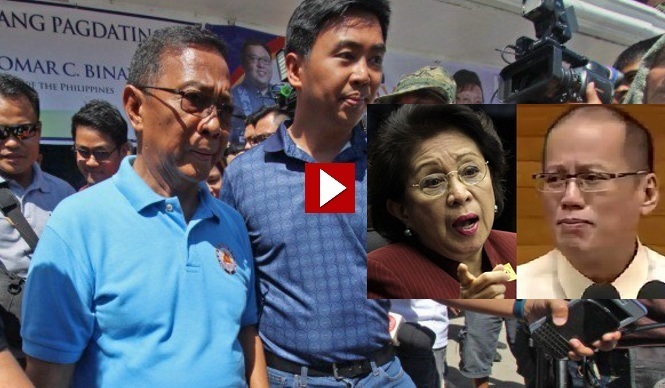 [VIDEO]: VICE President Jejomar Binay said he was hurt and sad about the graft charges he is set to face over the allegedly overpriced Makati car park building. Salgado reiterates; “This only proves our point. Even after the Liberal Party ends its reign, the Ombudsman continues to pursue the game plan against Binay. It is a kind of episode in the yellow playbook,” he said in a statement. Aquino turned his wrath into Binay when the latter refused to help the ex-President to block Bongbong Marcos for the VP post. Instead, Binay urged him to allow a clean election to happen but to no avail. Salgado said Morales denied the former vice president his right to answer the charges against him and his son. Makati City Mayor Jejomar Erwin Binay Jr. was dismissed from the mayoralty. However, Makati residents installed his sister, Abby Binay as Makati Mayor during the 2016 elections. Salgado added that; In her haste to indict the former Vice President, the Ombudsman committed the act of denying him his right to answer the allegations against him. The Binays’ indictment by the Ombudsman is the ultimate proof that the Liberal Party influence still exists despite not being in the most powerful spot anymore. This can be seen in the Congress with Gov. Imee Marcos’ case and is under close watch at the Supreme Court with Chief Justice Maria Lourdes Sereno for Bongbong Marcos’ electoral protest against Leni Robredo. Now, citizen Jejomar Binay condemned the political persecution over his “hasty indictment” on graft and falsification charges. This is in connection with the alleged rigging of the P1.3-billion Makati Science High School. The overpriced Makati car park building is a separate thing that also falls in the same tune.